Last week Liz and I planned and lead a ride with some members of Washington Area Bicyclist Association (WABA - http://www.waba.org) Fairfax Advocates for Better Biking (FABB - http://www.fabb-bikes.org/) to scout out ways to ride to some of the new Silver Line Metro stations being brought on line in the near future. We found a few surprises in getting around. Some stations are easily accessible by bike. Others are more of a challenge. The good and not-so good rides were not what I expected. Background: One of the great things about the new Silver Line Metro Stations is that they are all extremely well equipped with bike racks and bike storage lockers. At this point, most of these stations do not have a lot of automobile parking. That leaves getting to and from Metro by bus, taxi or bicycle. As a bicycle advocate, I took a keen interest in scouting out the routes to the Silver Line Stations. 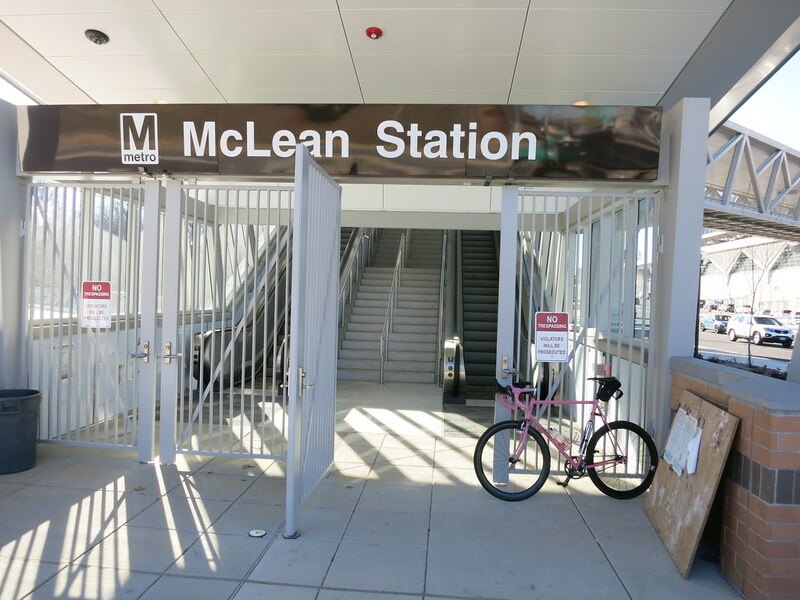 McLean Station turned out to be the most pleasant, and probably easiest station to get to by bicycle. The route from the south consists of mostly neighborhood streets that are quiet and enjoyable by bicycle. Here is the route that we took: http://ridewithgps.com/routes/3967935. It runs from Tysons Station Shopping Center (the intersection of Pimmit Drive and Leesburg Pike) to the McLean Metro Station. A slight variant on the route listed above is from McLean High School to McLean Metro station: http://ridewithgps.com/routes/3969948 Magarity Road has quite a bit of traffic, but is not bad for cycling. The route is quite convenient. The business park to the north comes from Freddie Mac, near Spring Hill Road around to Tysons Corner Mall. http://ridewithgps.com/routes/3967855 Jones Branch Dr. is busy, but has a very wide shoulder. It was an easy ride to the metro. There is access to the Metro Station on both the south and north of Chain Bridge Road. Spring Hill Station has an easy route from the south and the Westbriar Elementary School neighborhood: http://ridewithgps.com/routes/3969898. There are a few sections of multi-use trails. One of the routes that would be most useful to get to Spring Hill Station is from the north. Spring Hill Recreation Center and Park is a big part of the community. Unfortunately the roads between Spring Hill Rec Center and the metro are NOT safe for riding. The shoulders on Spring Hill Road are narrow and the traffic is heavy and moving quickly. We rode it safely at its lowest traffic time, but I wouldn’t recommend it to any but the most seasoned cyclists used to riding in high-traffic areas. I’m pleased to say that there are great cycling routes and great cycling facilities for these Metro stations! No. 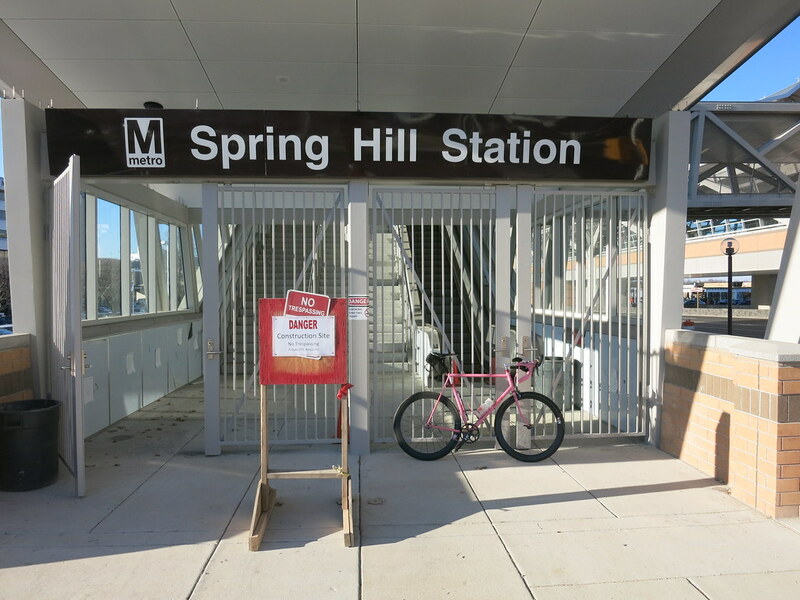 We rode to Spring Hill Station, as the photos and maps show. I will do some routes to Greensboro Park station, but I haven't worked them out yet. Thanks for the post and the maps. Very helpful! Great post Thanks for posting keep it up. Options from the North have improved recently. There is a new crosswalk at Spring Hill and Lewinsville. There is now a multi use path from Spring Hill and Old Dominion that ends at a crosswalk over Lewinsville. The path continues on the East side of International Drive and it is easy to ride down Tyco RD to the Spring Hill Metro stop. I tend to write what-ever bounces around in my head. Rarely does it make sense. It is often somewhat offensive. Please accept my appology for any sensibilities that I offend.